The following question currently has 19K views. I'm not so naive as to suppose that 19K different people have looked at it. Clearly some people have looked many times at the same question. What is the distribution though? (c) also relevant - how many users have been active on the site as a whole in a particular period, e.g. January 2019. Given the above stats, this can be used to work out what proportion of active users have looked at a particular question. I'm curious as to how many users are currently active on Worldbuilding (as opposed to the total of those who have registered since it began). By a user being active, I literally mean any activity including asking a question, answering, commenting, moderating or in particular simply reading a question. Maybe this could be determined simply by counting users who logged on during that time. for anonymous users, it is IP + QuestionNr. for authenticated users it is UserNr + QuestionNr. This information is saved in an expiring cache entry for about 15 minutes. If a subsequent hit sees the entry is still there it discards the new hit. If it is already gone it allows for a new record. That is, any time a post receives a view from a user (or IP address) that it hasn't seen within about 15 minutes, checked against a cache, it adds the user number (or IP address) to this cache. The buffer itself also expires after a few minutes or after it is filled up to a certain size, whichever happens first. When it expires, everything it has accumulated is written into the database in bulk. They call it a "buffered write scheme". So, in essence, each unique view within an approximately 15 minute window adds an entry to a buffer which updates the number of displayed page views by the number in that buffer either after a few minutes, or once it's full (whichever is first). All in all, this gives that, as the data is only temporarily stored, there's just no way of being able to answer parts (a) or (b) of your question - a quick check on the stored database values in SEDE confirms this. A partial answer to part (c) can at least be found by doing a SEDE search by 'LastAccessDate', which could be used to return the users who last accessed the site within a certain time period/since a certain date. For completeness, I ran this and got 9562 results. Generally, there are three major reasons for such view counts. A question is on a topic that people generally search for on search engines. A question is linked to on a popular blog, Twitter account, Facebook, etc. 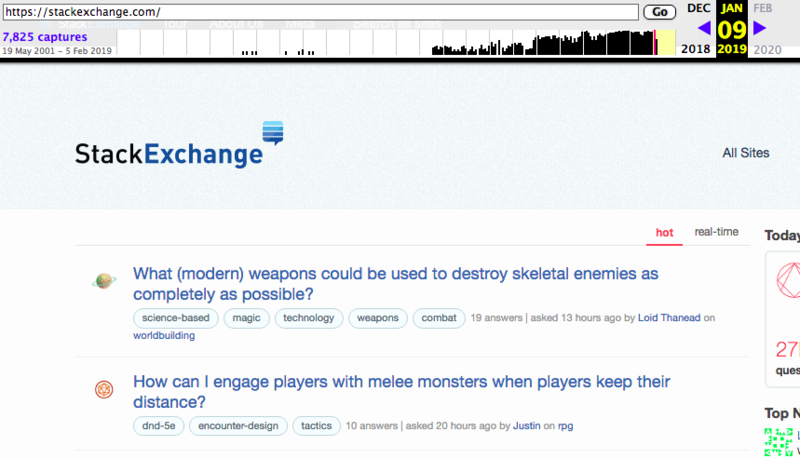 A question hits the Stack Exchange "Hot Network Questions", which causes it to be featured in the sidebar network wide, and thus viewed by a massively larger audience than only those who browse Worldbuilding regularly. On #1 and #2, the vote count is typically not that high, as most of the visitiors are not SE users, and thus do not have enough reputation to vote. On #3, a fair portion of the visitors are SE users with reputation from other sites, who thus can get the association bonus, and vote. Therefore, #3 results in considerably higher vote count than #1 and #2. Due to the reasonably high vote count on your question (and its answers), #3 seems more likely. We can use the Wayback Machine to confirm that your question was indeed a "Hot Network Question", in fact, it was at the top of the list, with over 200k hotness points shortly after it was asked. So actually, it is quite possible that the number of unique visitors is quite high, perhaps higher than you expect. Why is Worldbuilding Stack Exchange so good at answering questions? Can we encourage people to put more research into questions? Should a formerly bad question be punished forever?